 The DEA's Final Rules purport to regulate foodstuffs containing "natural and synthetic THC." And so they can: in keeping with the definitions of drugs controlled under Schedule I of the CSA, the Final Rules can regulate foodstuffs containing natural THC if it is contained within marijuana, and can regulate synthetic THC of any kind. But they cannot regulate naturally-occurring THC not contained within or derived from marijuana—i.e., non-psychoactive hemp products— because non-psychoactive hemp is not included in Schedule I. The DEA has no authority to regulate drugs that are not scheduled, and it has not followed procedures required to schedule a substance. The DEA's definition of "THC" contravenes the unambiguously expressed intent of Congress in the CSA and cannot be upheld. DEA-205F and DEA-206F are thus scheduling actions that would place non-psychoactive hemp in Schedule I for the first time. In promulgating the Final Rules, the DEA did not follow the procedures in §§ 811(a) and 812(b) of the CSA required for scheduling. The amendments to 21 C.F.R. § 1308.11(d)(27) that make THC applicable to all parts of the Cannabis plant are therefore void. We grant Appellants' petition and permanently enjoin enforcement of the Final Rules with respect to non-psychoactive hemp or products containing it. http://www.ca9.uscourts.gov/ca9/newopinions.nsf/90DC066FE8E8955688256E31007ACE3B/$file/0371366.pdf?openelement or from Vote Hemp here. Cannabis Food Products in Light of Ongoing Litigation, but there is no mention of their decision not to appeal HIA v DEA to the Supreme Court in their current News Releases. Vote Hemp had also asked for an apology from DEA, and even though the HIA won the case, I imagine that this will probably never happen. WASHINGTON, DC – The Bush Administration will not appeal the Ninth Circuit Court of Appeals February 6, 2004 decision in HIA v. DEA protecting sale and consumption of hemp food products in the U.S. The allotted time to appeal to the Supreme Court expired today three years after the Drug Enforcement Administration (DEA) issued a rule purporting to ban hemp food products. "The mandate of the Ninth Circuit is final and their decision will now be the law of the land," said Joseph Sandler, lead attorney for the Hemp Industries Association (HIA). "Removing the cloud the DEA put into the marketplace will spur a dramatic surge in the supply and consumption of healthy omega-3 rich hemp seed in America," says David Bronner, Chair of the HIA's Food and Oil Committee and President of Alpsnack/Dr. Bronner's Magic Soaps. "This is a huge victory for the hemp industry. The Bush Administration decision not to appeal the Ninth Circuit's decision from earlier this year means the three-year-old legal battle over hemp seed products is finally over. The three-judge panel in the Ninth Circuit unanimously ruled that the DEA ignored the specific Congressional exemption in the Controlled Substances Act (CSA) that excludes hemp fiber, seed and oil from control along with poppy seeds. The Court viewed as insignificant and irrelevant harmless trace amounts of THC in hemp seed, just like harmless trace amounts of opiates in poppy seeds." "More and more health foods containing omega-3 rich hemp nut and oil will be appearing on store shelves since the legal status is no longer an issue," says Alexis Baden-Mayer, Director of Government Affairs for Vote Hemp. "Americans are looking for healthy alternative sources of omega-3 to supplement their diets due to concerns regarding trace mercury in fish and fish oil supplements. Right now the U.S. marketplace is supplied by hemp seed grown and processed in Canada and Europe. We will now work to convince Congress it is time for the U.S. to again allow American farmers to grow industrial hemp and participate in this lucrative growth market." Eric Steenstra, Executive Director of Vote Hemp, along with Patrick Goggin, local counsel for the HIA, expressed anger at the colossal waste of industry and taxpayer resources consumed in the three-year legal battle over hemp waffles and other healthy hemp foods. "The industry should have been focused on marketplace promotion and consumer education rather than flushing over $200,000 down the drain battling pointless DEA hysteria," says Steenstra. Hemp Foods are Safe and Nutritious - DEA Rules Were Ridiculous! U.S. hemp food companies voluntarily observe reasonable THC limits similar to those adopted by European nations and Canada. These limits protect consumers with a wide margin of safety from workplace drug-testing interference (see hemp industry standards regarding trace THC at http://www.testpledge.com). The DEA has hypocritically not targeted food manufacturers for using poppy seeds (in bagels and muffins, for example) even though they contain far higher levels of trace opiates. The recently revived global hemp market is a thriving commercial success. Unfortunately, because of their paranoia DEA has confused non-psychoactive industrial hemp varieties of cannabis with psychoactive varieties, and thus the U.S. is the only major industrialized nation to prohibit the growing of industrial hemp. Please call Adam Eidinger at 202-744-2671. Beta Sp or DV Cam Video News Release Available Upon Request. Kelley Fitzpatrick - NutriTech Consulting - "Consumer Attitudes and Market for EFAs"
Grant Pierce - U of Manitoba/St Boniface Hospital - "The Effects of Dietary Hempseed on the Cardiovascular System"
Steven Schroeder - Health Canada - "Results from 2004 Cannabinoid Survey of Hemp Foods"
Keith Watson - Manitoba Agriculture, Food and Rural Initiatives - "Field Work, Variety Comparisons at Different seeding rates and evaluating for Fibre and Grain Yield"
Gordon Scheifele - Ontario Hemp Alliance - "Ontario Fibre and Seed Breeding Project 2004"
Satya Panigrahi - U of Saskatchewan - "Fibre R&D Initiatives"
Gero Leson, Scientific Advisor - Current Research and Market Development Initiatives for Hemp Foods"
Hemp Food Marketing Panel - "Bringing the Food to the People"
Parkland Industrial Hemp Growers - "Plant Update and Seed Project"
BioHemp Environmental Technologies - "BioBlocks and Hemp Paints"
"We've put together a very interesting program for this year's conference," says Arthur Hanks, Executive Director, CHTA. "The 2004 Conference includes a strong mix of topics -- hemp seed food, production, marketing, and research, as well as fibre processing, economic development and new opportunities. The event is a solid opportunity to learn more about hemp in Canada, to plan for the future and to network within the industry." This event follows the University of Manitoba's "Conference on The Role of CLA in Human Health: Mechanisms and Biomarkers", to be held at the Fairmont Hotel on October 21-23rd. The Fairmont Hotel is located at 2 Lombard Place, near the intersection of Portage and Main. See http://www.fairmont.com/winnipeg/ for more information. Conference fee is $50 for CHTA/ACCC members and 75 $ for nonmembers. Table/display opportunities are available for $50 to CHTA members. Space is limited. Ticket Sales and Preregistration are now open. 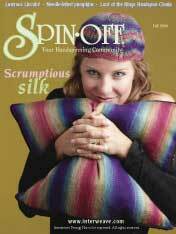 The Fall 2004 issue of Spin-Off magazine from Interweave Press is out on news stands now and there is a great four page story called "Fiber Basics: Hemp" by Janet Szabo in this issue. So many stories about hemp are full of giggle factor, but not this one. The sentence "Without getting into the controversy regarding this plant, it is worth noting that the two strains—hemp for fiber and hemp for marijuana—are distinctly different." really says it all and it is obvious that Janet gets it. There is a lot of very good background information about hemp as well as excellent practical information on working with hemp fiber and some very good resources. I won't spill all the beans, if you are serious about working with bast fibers you will want to buy this issue, but I do want to note that Dr. Dave's Hemp Archives gets a mention as well as the fine hemp fiber from Aurora Silk. My wife found Aurora Silk a couple of years ago and bought some hemp fiber from them. 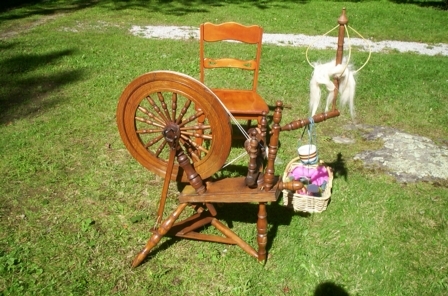 She enjoys doing spinning demonstrations using a restored antique flax wheel than my Grandfather gave her. So much hemp fiber is passed off as good quality hand-spinning fiber, but most of it is not much better than unwrapped hemp jewelry cord or hemp oakum that you would want to caulk the seams of your classic wooden boat with. This stuff from Aurora Silk is lovely! You can see more about this fine hemp fiber here. 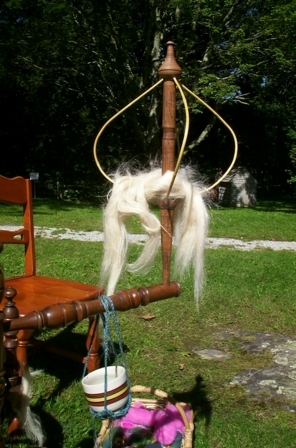 Above is a close-up of the distaff on her wheel with some hemp fiber on it. You can also see a nice picture of this fiber here. We in the hemp industry would do very well by our customers to find and bring to market high quality fiber such as this! Here is a family favorite that we enjoy for breakfast or lunch. My ten year old loves to make this for all of us. This is great served with Apple Oat Cakes or Waffles or grilled ham and cheese sandwiches made with Hemp Oatmeal Bread. You will need to log in to see these recipes. Please see our FAQ to learn how to subscribe to The Hemp Report and get full access to our web site. It's free! Put the shelled hemp seed and the mandarin oranges in the blender and blend on high (with the lid on, of course) until smooth and hemp seed is in very small pieces. 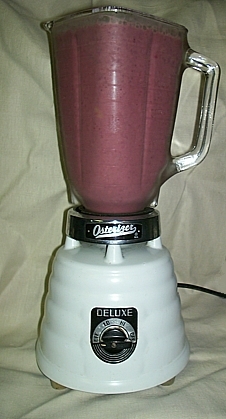 Drain the pineapple chunks, reserve the liquid, and put the pineapple chunks, frozen blueberries, and banana in the blender and blend on high. Take the little cup of the blender lid and with the blender running add the frozen mixed fruit until the texture suits you. You can use the reserved pineapple juice to thin the smoothie if necessary. Notes: The frozen mixed fruit I get has peaches, strawberries, grapes, and honeydew melon in it. If you like your smoothie sweeter you can add a couple of tablespoons of maple syrup. Serves four. 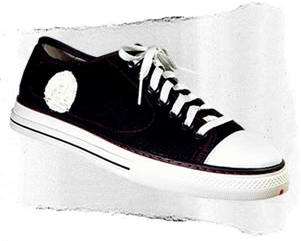 If you are tired of searching eBay for new old stock Adidas or Converse hemp sneakers you might consider the Blackspot Sneaker from Adbusters. Their mission is to establish a worldwide consumer cooperative and to reassert consumer sovereignty over capitalism. To find out more about the Blackspot Sneaker please click here. You can see the shoe in QuickTime 3D. And you can place your order for a pair on Adbusters secure order page. Major grocery chains are now starting to discover hemp food products. 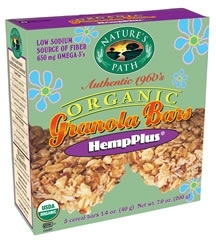 This afternoon I was shopping at Nature's Place, which is in Hannaford grocery stores, and I found that they now carry the new Hemp Plus Granola Bars from Nature's Path. Hannaford already carries Nature's Path Hemp Plus Granola in the bulk food aisle and Lifestream Natural Hemp Plus Waffles. 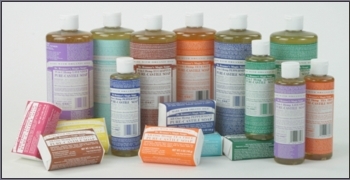 In addition to the Nature's Path products Hannaford has carried Dr. Bronner's soaps, both liquid and bar soap, since they did a major reset of Nature's Place a few years ago. Now if we can get them to carry Alpsnack I would be really happy, as would my kids who really love them in their lunch boxes.